The universe is younger than it seems. The Big Stretch on Creation Day 4 explains much of this. But did light also slow down? The speed of light in a vacuum is 299,792, 458 meters per second. With nine digits, that’s a very precise value. The more precise your measurements, the easier it is to tell whether a value has really changed, or only seems to have changed because your ruler, clock, scale, or whatever you use, is off. Barry Setterfield and Trevor Norman looked at 164 published values of the speed of light over 300 years. He found that light has slowed down, and is still slowing down. Walt Brown (In the Beginning) checked his math, and the math of other astronomers (Gerald Aardsma and Robert Brown) who disputed Setterfield. Alan Montgomery checked Setterfield’s math independently and calculated a quadratic or “square-function” curve that would best fit the numbers. His conclusion: yes, light has slowed down, and experimental error cannot explain it. The published values are too precise for that. In fact, light has slowed down one percent in the last 300 years. The speed of light has the symbol c (for “constant”). But Einstein never said it was constant. He said it was independent of frame of reference. That is, the speed of light is the same, whether you are standing still relative to the lamp, or moving toward or away from it. You could even be speeding up or slowing down; that makes no difference. The problem: even the fine-structure constant has not stayed the same. It changes over time, and is even different in different parts of the sky. Obviously if the speed of light were significantly faster at creation than it is today, the universe would seem older only because light from far-off objects took less time to reach the earth. But the fine-structure constant also affects atomic nuclear changes. A declining fine-structure constant would explain why cesium clocks (that “tick” from a particular transition of cesium-113) seem to show that the year is getting shorter over time. That cannot be. If it were, that would mean that gravity was getting stronger. Gravity is an entirely different fundamental constant, and no one has observed anything to imply that gravity is strengthening. Therefore, the atomic clocks are running slow. And if atomic clocks run slow, so does radioactive decay. That would mean that radioactive decay was faster earlier in history than it is today. Three hundred years might not be long enough to set a trend that would carry back to Creation Day Four. Setterfield and others suggest that light once flew a million times faster than it does today. If true, then if radioactive elements were part of the earth’s crust at creation, the radioactive emissions would have killed all of life. (Of course, if God made the earth without radioactive materials, and those materials formed only later in history, this is a moot point.) Walt Brown suggests another test: that far-off double stars, galaxies, and larger objects should spin far more slowly than they should, as if we were watching them in slow motion—extreme slow motion. Today most astronomers have seen the opposite effect: fast rotation, that they sought to explain with “dark matter.” But the Hubble Space Telescope, or more likely its slated replacement, might see large objects rotating in slow motion as it looks deeper into space (and time). Secular astronomers have known since 1998 that the universe is expanding, and is speeding up, too. Either something is pushing the universe apart, or something pulled the universe to its present size. The only push would have to come from “dark energy.” No one knows what that “dark energy” is, but it would have to speak for three-fourths of the total mass-energy of the universe if it existed. Moshe Carmeli predicted the accelerated universe in 1996. John Hartnett (Starlight, Time and the New Physics) later refined Carmeli’s model by accounting for the mass in the universe. He concluded that the universe would look old only because it had stretched ten trillion-fold on Creation Day Four. The Big Stretch did not accelerated light but it dilated time. So when the Bible says that the earth is only 6016 years old (give or take a year or two), it means by local clocks. The truth probably lies somewhere in the middle. Light need not have slowed down tremendously if the universe stretched. The Big Stretch alone could explain why we see far-off objects after only six thousand or so years had passed (by our clocks and calendars). That does not mean that light did not slow down. Now even some secular scientists admit that a key constant, that the speed of light depends on, has changed over time. How much it changed in six thousand years, we might never know. Uniformitarianism says that any time-dependent function that accurately describes a change today will always work in the past. Or to quote an old uniformitarian proverb, “the present is the key to the past.” But it’s not safe to assume such a thing, because conditions that set the rules today might not have been the same in the past. That applies equally to speed-of-light “decay” as to radioactive decay. So light has slowed down, and is slowing down. But whether it has slowed down at the same rate is not settled. Conventional astronomers today assume that the universe is 13.7 billion years old. They base that on the distance of the farthest objects they have thus far seen. They calculate that distance at 13.7 billion light years.Therefore, assuming an unchanging fine-structure value, hence an unchanging speed of light, the universe is as old as it took the light to travel from the far reaches of the universe to the earth. But, as Brown observes, conventional astronomers have their own problems with saying consistently how old the universe is. Astronomers see stars that, by their own rules, must have existed for sixteen billion years. Some of those stars contain heavy elements, meaning heavier than helium and as heavy as iron. Again by their own rules, this takes time. Saturn’s rings, if they formed by a collision between a comet and a moon, must have formed thirty billion years ago by conventional rules. On the other hand, Saturn’s rings, with their intricate patterns, could not have lasted much longer than 100 million years. The first two problems resolve easily with a young-universe model. 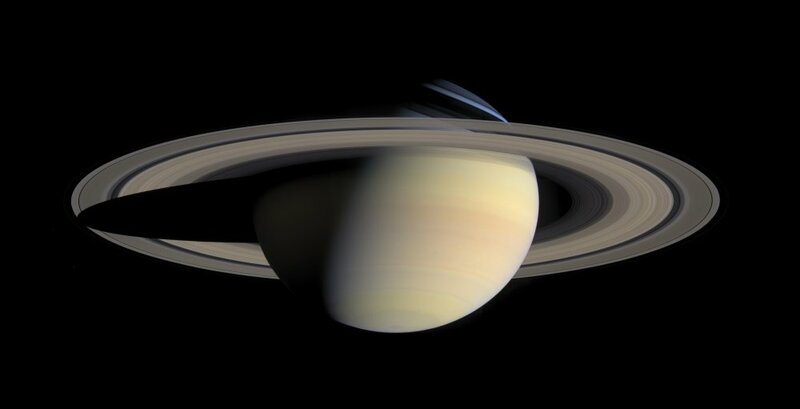 The other two (Saturn’s rings) depend on another event, one that filled the solar system with many comets at once, so that at least one wold collide with one of the large moons of Saturn to make the rings. These are some of the reasons why the universe is much younger than conventional astronomers assume. The universe began with the earth on Creation Day One, and with the other objects (most of them) on Creation Day Four.